As you all know, a few weeks ago I had The Talk with my trainer, and we decided to go on a search for my very own unicorn. We very quickly found a super cute chestnut, and just as quickly realized that while he was a FANTASTIC pony, he wasn’t our pony. I won’t even keep you in suspense: Frankie is perfectly perfect in every way. I’m totally not biased or anything, that’s just scientific fact. Happy pony has the sweetest face!!! He’s a 10 year old Oldenburg x TB, 17hh, dark bay without a single bit of chrome (and it looks like his summer coat has some lovely dapples), and I LOVE HIM. He’s been a foxhunter for a couple years a.k.a. SUPER brave and nonchalant about everything, and has been doing some lower level eventing lately. We think he’s going to be the perfect jumper. Side note to the eventers out there: do you know the name Phyllis Dawson? She went to the Olympics for the U.S. back in the day. She’s the one that sold us Frankie, and she called him a “jumping machine.” So yeah, no big deal, an Olympian just called my boy a jumping machine. Super casual. On the flat, he’s super duper comfortable. He could use a bit more polish before we step into the eq ring, but he’s very willing to do whatever I ask of him. He really gets swinging beautifully over his back in the canter and is very easy to leg up into the bridle. He also has the rhythm of a metronome- you could seriously set your watch to the consistency of his stride. I don’t know if you can tell, but this is on a pretty loose rein. I think we’re gonna be able to do the eq just fine. Which makes it really easy to see a distance on him. It doesn’t matter what the jump looks like or how high it is, he approaches it with the same steady stride. Which is a POWERFUL stride- even when I got tight to a one stride, he powered out with very little assistance from me. He’s a little rusty on his changes- because he’s been a foxhunter, he’s never really been asked for them- but I got a couple and I don’t think it’ll be a problem to install them. He’s got the brain, the balance, and the muscle. Like, SUPER nonchalant about this oxer. Which was out of a one-stride combo. Because I am an ammy, I totally buried him to the base of this big wide 3’3″ oxer. And then accidentally jabbed him in the side with my spurs. How did he react? By jumping it without a problem, landing and loping away, and giving me a clean lead change. Homeboy does not hold a grudge. Good attitude. Yup. He’s kind, he’s friendly, he’s sweet, he’s willing. Safe. Yup. He’s super sane and bombproof. Able to jump. YUP. 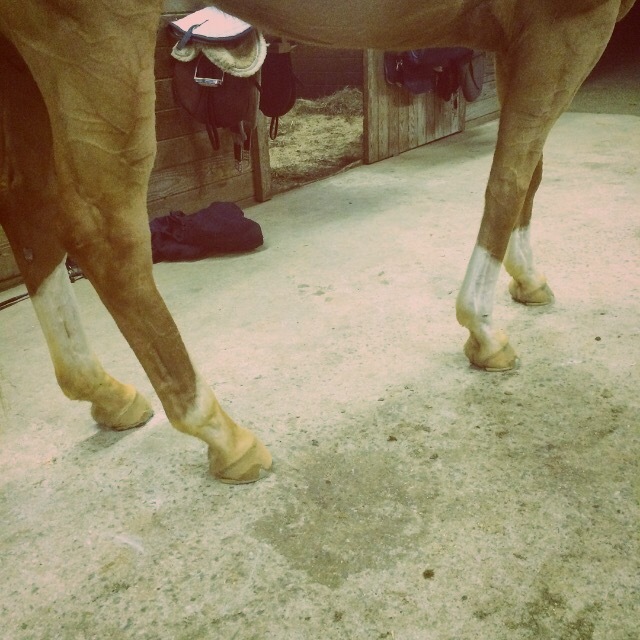 He basically took a slightly bigger canter stride over a 3’3″ oxer. We may want to teach him to use his body a bit better, but he has scope for days. That “X” factor. You know that feeling when you sit on a horse and something just clicks into place? Like not only could you be partners in the future, but you’re already partners. He’s got that. The vet came out Tuesday and loved him just as much as I did. He’s sound, maintenance-free, an easy keeper, and ready to get to work. Less than 24 hours after the vetting, Frankie is home and settling into his new life with me. Already mooching for treats. He knows a sucker when he sees one. This big brown boy is going to be spoiled rotten. I can’t wait for our adventures together. I’m sure many of you remember Jenn from Stories from the Saddle- she’s taken a hiatus from blogging but we’ve stayed close! I FINALLY managed to get her down to VA for a visit, and then convinced her to guest post about it 🙂 Enjoy! Apologies for the delay on writing this guest post, work has been (unexpectedly) INSANE for the past two days, and I’m trying to steal away some time this morning to tell you about my weekend with Olivia! Olivia came to NJ to visit me last summer, and we always talked about me going down to Virginia to visit her, and last weekend worked out for both of us, so I made the drive down. I actually ended up driving down Thursday afternoon-ish, which was both a blessing and a curse, because I hit Baltimore/Arlington/DC traffic right around 5pm, so it took me almost 4 hours to get there. But, no matter! Here’s the rundown of how our weekend went! I met Olivia at her barn around 6pm on Thursday evening, right as the sun was beginning to set (Daylight Savings Time, I love you), and let me just say that Olivia’s barn is GORGEOUS! It kinda sits on top of a hill, and the views from the paddocks and outdoor ring are really beautiful. First order of business (after getting a proper tour) was MEETING THE DRAGON MARE! Addy was slightly taller/bulkier than I expected, but she’s absolutely, 100% a Beast Mare. Olivia pulled her out of her stall, gave her lots of kisses, and we headed to the outdoor ring. Olivia rode her around first, and then I hopped on! From the word go, you can definitely tell that Addy has some serious power in her gaits, and it took me a few minutes to figure out how to half-halt hard enough, I’m used to Roger’s more sensitive mouth. But, once I figured that out, Addy was really a super fun ride! She’s got all kinds of fun buttons to push, and I really enjoyed riding her. Then, Olivia asked me if I wanted to jump her, and I was slightly hesitant because it’s SO MUCH POWER. Olivia got back on her and popped her over some barrels, but I was pretty intimidated so I opted not to jump Addy around. We only had the one jump set up in the outdoor, but I watched Olivia jump Addy over it, and decided that I was good to go. After that, we were able to catch the end of the adult ammy lesson in the indoor, and I’ll freely admit that I’m a lesson nerd: I’m a visual learner, and I really enjoy watching lessons, so it was cool to watch. I was also able to catch D’Arcy on her mare Gracie (of The Clueless But Curious Rider blog), as well as 4 other adult ammys on horses with various levels of training. But the way her trainer worked everyone together was fun to see! After that, we unloaded Olivia’s new Stanley trunk from her car and into the tack room, and headed out for food, since we were both starving by that time. She took me to this great Mexican restaurant not far from her house (or the barn), and we got drinks and food and chatted about plenty of horse things, as horse people will do. After that, we got back to her apartment, I met her (totally awesome) roommate and her dog, and we got to bed around midnight. On Friday morning, Olivia had to work for a few hours, so I was perfectly content to chill at Starbucks until she picked me up, and we headed to her barn to grab her trainer and her saddle, and then made the short drive to a nearby trainer’s barn to try two horses. And, I got to meet Olivia’s other trainer/mentor/life coach, who actually reminds me of my own trainer in a lot of ways. Her trainer is definitely no muss, no fuss, but you can absolutely tell that she knows her stuff and always tries to get the best out of her riders. She’s also super knowledgeable, and it was cool to listen to her conversation with Olivia both ways in the car and get a feel for why Olivia and her students love her so much. After trying the horses, we were – again – starving, so we drove over to this cool American restaurant and sat outside on their patio, since the weather was SO nice. We actually got really lucky with the weather all weekend, it was sunny, slightly breezy and around 70 degrees, which was perfect! Again, we had drinks and yummy food and talked all things horses, and cracked open a bottle of wine when we got home and sat around her apartment to hang out…as adults do. Before I got down there, Olivia asked me what kinds of things I wanted to do during the visit, and brunch and going to a winery were definitely on my list, so that’s what we did on Saturday! Olivia, myself, and her roommate did brunch at this really nice place a few minutes from her apartment, and we chatted for over an hour about all kinds of things. The conversation was great, and the food was awesome! After brunch, we drove over to Stone Tower Winery, at Olivia’s roommate’s recommendation, and tasted a few wines before buying a few bottles and snagging seats at a table overlooking the rolling hills and a small pond. The winery was pretty crowded but it didn’t matter, because everyone was enjoying themselves outside and sipping the delicious wine. It was SUCH a great day, we stayed at the winery for a few hours, and it was the perfect ending to a wonderful weekend. We grabbed pizza on the way home and brought it back to Olivia’s apartment, before relaxing for the rest of the night. On Sunday morning, we both slept in slightly, and then we got dressed and ready to go. Olivia was headed to some Easter festivities, and I was planning to get on the road back to NJ. I actually made it home in under 3 hours, which was great, and didn’t hit any traffic on the way back. Overall, it was such a PERFECT weekend full of horsey things and wine, which is always the best combination. Though I’ve only met her once before, Olivia and I didn’t skip a beat, and we had such a great time the whole weekend! Hopefully we can see each other again soon! The DragonMare is SO GOOD. Srsly she’s the bomb dot com. Our lesson yesterday did not involve any tight turns or crazy difficult exercises- we worked on a grid and then a couple single diagonal jumps. Our main focus with this lesson was getting Addy to come in quietly so I could leg up to the jumps instead of holding her to the base. She has a tendency to run at jumps a bit and I end up having to holdholdhold or we’ll run through the distance, and we’d really rather not have me hauling on her face in front of an oxer. Addy was such a good girl about this! We came through the grid a couple times and she got better each time- coming in nice and quietly so that the one-strides were soft and flowing, with the oxer out looking like a million bucks. Once we had the grid in a good place, we added two single diagonal jumps. The goal here was to land off the grid and get a nice short bouncy canter back before coming down a swedish oxer. Then we wanted to get that nice short stride back again before going up a stone wall on the diagonal. The first few times through, I chose to circle before heading to the single jumps. I tend to tense up a bit when heading down to a single, which leads to Addy getting tense, which leads to freight train mode, which leads to holding her face, which leads to no bueno for anyone involved. So instead of heading straight down the diagonal to the jump, we circled and made sure we were on the same page and breathing. And whatdya know, we got a wonderful relaxed stride up and over the oxer! Then I used the short side to get our little stride back and *GASP* I actually legged up to the stone wall jump!!! Ask big, ask early, and then soften. Do my homework setting the pace and stride as soon as possible, so I’m not fussing on the approach. Ask as hard as I need to in order to get a response, and then soften and allow her to maintain. Ask again if needed, but every time, give her the opportunity to develop that self-carriage we’re looking for. Believe in the spot. If I lean up her neck every time we get a short spot in, she will decide that the short one STINKS and we’ll go back to taking fliers every time. Shoulders back and wait for her to come up to me. Breathe and smile! Jumping is just flatwork with a few big steps thrown in. And we love to fly. I’ve gotten much better about breathing and relaxing on course lately and I’ve noticed a HUGE difference in the quality of our rides. I wish I had gotten this on camera, but when I voiced that to my trainer, she just said that I can get this ride every time now and film it next time. I appreciate her foolish faith in me. I’m a little late to this party, aren’t I? But better late than never! Get comfortable schooling full courses at 3’3″. Yep! It’s rare that every single jump in our lessons is a full 3’3″, but I’ve been quite comfortable popping over whatever height is set. Jump 3’6″ regularly. “Regularly” may be a strong word, but we’ve done this with varying levels of consistency and been very happy doing so. Compete in the Adult Equitation Medal class at least once. Competed in the Dover and Ariat adult medals down in Ocala! I guess this was technically in 2016, not 2015, but whatever. This is my blog, I can bend the rules however I want. YOLO. Try a jumper class. Lawlz yes I’ve done this lots. Make it to an “A” horse show. Ocala FTW. Learn how to braid manes and tails. I actually did some practicing! I wouldn’t hire me, but I definitely get the theory and can/should keep practicing. Live through a lesson without stirrups. A full lesson? Ehhhhhh. But I can last as long as my trainer asks us to without dying, which feels like an eternity. Go on at least one trail ride. We spent lots of time last summer/fall exploring off property, and I can’t wait to get back out once it warms up again! Keep my confidence up. So far so good! Of course I’ll have some nervous moments, but I’ve been able to take a deep breath and give myself a little pep talk. Buy a horse. This is an obvious one that I’ve talked about a couple times so far, so I won’t belabor the point. I would love to have a magical unicorn to call my very own. Improve my lower leg. I have decent eq in general, but I’ve noticed that my lower leg stability doesn’t have the level of consistency that I’d like. Some days it’s great, other days it looks like a turd sandwich. Learn how to ride a variety of horses. I’ve been lucky enough to ride horses that I get along with really well, and of course the DragonMare has been a blast. But I don’t just want to be good at riding Addy, I want to be good at riding horses. If anyone in northern VA needs their horse exercised, let me know! I probably won’t be able to make them better, but I’m 80% sure I won’t completely ruin them. Probably. Show in a jumper class at 1m. This depends on a variety of things, mainly what horse I’ll be riding. If I end up with a show-ready horse, this could happen rather soon. But if we decide to take on a younger horse, we will be taking our time to slowly build up experience. Go double clear 60% of the time. I’d obviously like to shoot for 100% of the time, but lets be realistic here. I’m an ammy and I make silly mistakes. If I can go clear more often than not, I’ll be happy. Learn more about training green horses. I find the process of teaching a young horse fascinating. 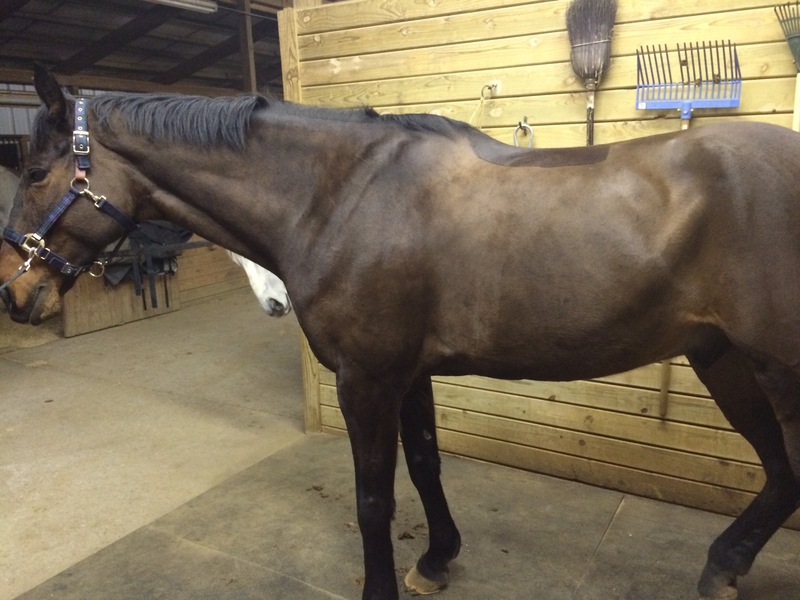 We have a couple RRP horses at our barn that are coming along nicely and I’d like to observe, and I plan to ask tons and tons and tons of questions/do lots of reading on this topic. Readers: I’d love any insight you have in this area, I know lots of you have brought along your own green horses! I think that covers the big ones for now. Any suggestions for other goals to put on the list? I also have a question for you, that I’d love to put together into a blog post. I’ll also be asking this on Twitter/Instagram, so feel free to answer there! When you bought your first horse, what were some surprise purchases you had to make? We all know that we need a bridle, girth, etc., but what did you end up needing that wasn’t on your list? 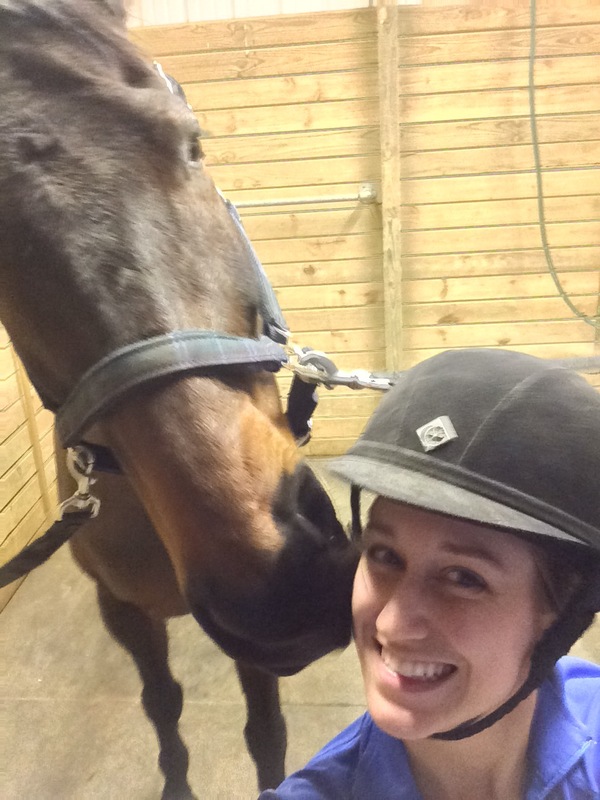 Horse Shows and Vettings and Lessons, Oh My! Hold onto your butts, because this post is going to be a bit of a fast-lane-let’s-talk-about-lots-of-things-all-at-once type of things. The chromey chestnut I teased you with pictures of: we had the vet out to give him a thorough head-to-toe, and ended up deciding not to make an offer. He’s a FANTASTIC horse and will make someone very happy, and I had a blast riding him! But in the end, I’m looking for a jumper to take me up to 1.10m, and that’s going to be a tough job. We are happily continuing the hunt (my trainer is checking out 4 today) and I will keep you all updated! I have to say, I’m really really enjoying this whole process. I’m getting to try out some phenomenal horses and I learn something new from every horse I sit on, my vet has been incredible about explaining everything he’s looking at so I’m learning tons about conformation and soundness, and it’s a great excuse to say “sorry I can’t go out tonight, I’ll be at the barn.” Good stuff all around. It’s been really interesting to talk through what we MUST have versus what’s NICE to have. With a fairly limited budget there’s going to be plenty we have to compromise on and we’re being realistic about that. What we MUST have: a good brain/attitude and athletic ability/potential. Basically, a horse that can jump and likes to jump. Any sort of polish or mileage we can work on- I’m not in any rush to make it to the big leagues, and I’m fine with taking some time to develop a diamond in the rough (under the guidance of my trainers who are infinitely better at this type of thing, of course). My trainer knows exactly what kind of ride I like and what my goals are, so I can’t wait to try out any ponies she thinks could be the magical unicorn! We went to a show! I took the DragonMare to a small local jumper show to play around in the 2’9″-3′ division and we had a blast. We had a nice relaxed warmup where she softened nicely to the jumps and loped around all sweet….and then she heard the buzzer and transformed back into the Beast. Which is fine by me! I did have to waterski a little to get her attention on occasion, but we were flying around the courses and having a blast. I even got to meet Shelby from blogland and her horse Justin! How cool is it to meet someone in person and instantly have that bond?? She and Justin are also TOTAL freakin’ rockstars and you definitely need to keep up with their adventures. I also loved this show because a younger rider (she’s 12 or 13) joined us for her first show with our barn. D’Arcy (thecluelessbutcuriousrider) and I took her under our wing and showed her the ins and outs- how to load up the trailer, tricks for memorizing courses, helping each other tack up, things like that. She was so sweet and enthusiastic about joining in, it made me so happy! For those of you who don’t know, I worked as a camp counselor for a couple summers and there are few things that make me happier than hanging out with tweens and ponies and sharing ideas. Especially when the kiddos have good attitudes and want to work hard and learn! It makes my heart sing. This was likely my last show with Addy since I’ll be saving my pennies to buy my unicorn, and I couldn’t have asked for a better way to go out. It was a year to the day after our very first show together and it was pretty insane to compare the two shows. From clomping around the 2’6″ hunters to galloping around the 3′ jumpers, this mare has taught me so much. She has certainly challenged me in different ways, pushed me to be the best rider I can be for her, pushed me to learn different ways to communicate, and above all else, she has reminded me that this sport is SO MUCH FUN. I could go on and on and on about everything this horse has given me: the joy of flight, the confidence that I can handle any garbage thrown our way, the muscles and physical strength to feel good in my body, the companionship on hard days, the sweet kisses and scratches, the belief in my own leadership skills that has translated to every area of my life, and so much more. I’m tearing up just writing this down! But you can all rest assured that no matter what happens, I will be loving on the DragonBeast and thanking her every single day. I’ve also had a couple great rides with the DragonBeast lately. I think a lot of the bobbles we’ve run into in the past are slowly resolving, and we’ve been having a ton of fun with it. I’ve been feeling more confident which translates into softer, more relaxed riding, which translates into a softer, more relaxed horse. I’m feeling much stronger after Ocala bootcamp and that has let me pick Addy up and carry her over the jumps when necessary. I also think that starting the horse hunt has taken some of the pressure off- I’m not trying to move up on Addy anymore. We can focus on fixing our mistakes and having fun together without worrying about whether or not she would be happy doing the 1m jumpers. In non-horse news, my job has been awesome lately! I got to speak briefly at a conference in front of 350 people this week which was SO FUN. I’m not particularly good at public speaking, but I really enjoy it and hopefully they’ll let me keep practicing. And I get to wear fancy clothes! My work wife/twin and I have gotten to work together roughly 38 hours out of the 40 we’re in the office each week which makes everything waaaay more fun. Yeah, we have matching mugs. You can be jealous. I want to thank this whole community. In good times and in not-so-good times, people from blogland have reached out to share in the joys and troubles. I sound like a broken record lately- I have the absolute best support system a girl could ask for! As I was just telling one of these awesome ladies the other day, it makes me smile so big that there’s this network of badass women all over the country/world rooting for each other and offering a helping hand! I’m sending virtual hugs to all of you. Unless you’re not a hug person. Just kidding, you’re getting the virtual hug no matter what. I’m a hugger. …but I wouldn’t mind if you all crossed your fingers real tight and sent some good vibes my way. Because as we all know, what do you do when you have crippling back pain? That’s right, folks, you hop on a horse and try to aggravate that back pain. Right? No? That’s not recommended? I must’ve missed that memo. Anywhosicle, flat work was uneventful. I powered through the pain using a combination of weird perching two-point and grimacing while posting. I managed to sit a few strides of canter once I had warmed up a bit- progress! Whether she was being kind because she sensed my pain, or she was fat and lazy from me being gone, Addy gave me the sweetest hunter-y canter around. Considering I was perched like a T-Rex 90% of the time (heels up, legs back, shoulders hunched, arms scrunched, reins longer than the Amazon) and had absolutely zero leverage to package her up, I was super grateful that she took pity and gave me her beginner-safe canter. Like this, but with worse eq. On to the fun stuff! We worked on more gymnastic-y type exercises, none of the jumps was bigger than 2’6″ (I think…..I’m notoriously bad at judging jump height. I’ll think 2’3″ is 3″ and I’ll think 3’3″ is 2’9″….I honestly have no idea anymore). After warming up, our main exercise was as follows: bending line, up the single diagonal, halt. Then trot-in-canter-out the center line in four. And when I say four, I mean a teeny tiny little four. A four that a pony got comfortably. And we were instructed to also put four. On Addy. PSYCH! We got the four every time! Once the adrenaline from jumping was flowing, I totally forgot that my back hurt, and sat down and asked hard for the striding. Addy was a super good girl- she likes it so much better when I’m present and communicating every step of the way. We got a nice conservative bouncy step in the bending, rode up out of the corner to the single diagonal, had a (moderately) civilized halt, and then pitter pattered through the center line. Success! Cherry on top of a good ride? My trainer saying, “Wow, you must’ve grown some cojones down in Ocala!” Woot woot! I definitely felt like I learned a ton down in Ocala, so I was absolutely tickled pink to hear that the progress is visible. And I believe I promised you exciting news. I told you that Ocala was pretty life-changing, right? Well, after catching the show-bug, a conversation with my trainer, and a close inspection of my bank account…. We are hunting for a unicorn to call my very own. I don’t plan to share too many details about the hunt out of respect for other people’s privacy, but I’d love any good vibes you could send my way! And at some point in the *hopefully* not-too-distant future, I should have a new fuzzy face to introduce you to.